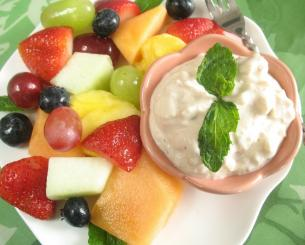 This is a great party dip and will serve a large amount of guests! Great to dip fresh fruit and serve with freshly made lemonade! Process cream cheese, yogurt, pineapple and SplENDA Granulated Sweetener in a food processor or blender until smooth, stopping to scrape down the sides. Spoon into a serving dish; cover and chill. Serve with an assortment of freshly sliced fruit. Yum,yum. Nice & easy these kind of recipes is what I always look for. Can we have it with Veggies to?